) form of the proper time equation is needed, along with a parameterized description of the path being taken, as shown below. Cook, R. J. (2004). 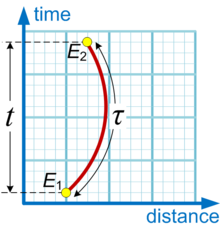 "Physical time and physical space in general relativity" (PDF). Am. J. Phys. 72 (2): 214–219. Bibcode:2004AmJPh..72..214C. doi:10.1119/1.1607338. ISSN 0002-9505.